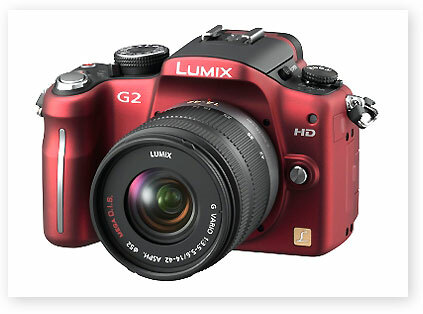 Panasonic has joined the fight to create the ultimate hybrid camera with the launch of its Lumix DMC-G2 camera. The Japanese electrical company is the latest manufacturer to produce a model that aims to provide the abilities of a quality DSLR in a more compact and user-friendly appearance. Mimicking the shape and control layout of a conventional DSLR, the G2 incorporates many of the best bits of the manufacturer's compact and DSLR ranges. This includes the intelligent Auto (iA) mode from the compacts, which allows newcomers to familiarise themselves with its more advanced capabilities before tinkering with settings. And among those settings are offered HD 720p, AVCHD video recording alongside 12.1Mp Live MOS Sensor; and Micro Four Thirds technology together with a 144-zone multi-pattern sensing system. The camera's 3-inch touchscreen LCD display can be tilted and flipped for versatility and protection, and a 1,440,000-dot-equivalent Live View Finder sits in place of the customary optical display found on conventional DSLRs. And like cars quickly ventured away from Henry Ford's 'any colour as long as it's black' tenet, the camera's tactile and slim rubber body comes in black, red or blue. The camera is an ideal starter model for those looking to develop basic photographic skills and combined with one of our photography courses would would be a perfect starting point for any potential photographer.